The 2nd Calamay Festival 2016 will showcase calamay – themed kites in the 2016 Tabanog ni Calamay competition. Impressiveness (ability to attract and capture audience’s attention). Only 10 entries will be accepted at the Municipal Engineering Office c/o JR Cagas. Consolation Prize @ P500.00 for non-winning entries. Deadline of submission of entries will be on April 25, 2016. 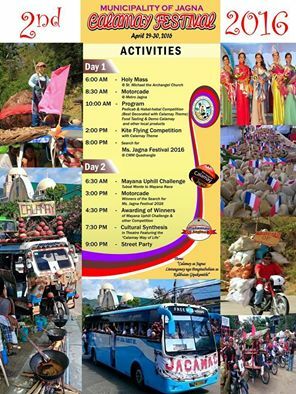 Come and witness the 2nd Calamay Festival 2016!